Grand Entrance to Babylon through the Ishtar Gate,which was partially Reconstructed in the Pergamon Museum in Berlin. 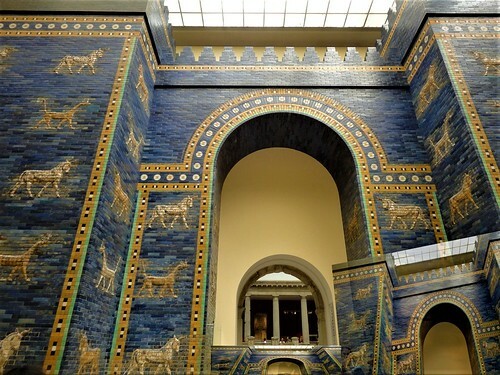 The Ishtar Gate,named after a Mesopotamian Goddess,was one of the eight gateways that provided entry to the inner city of Babylon during the reign of Nebuchadnezzar II (reign 605-562 B.C.). It was decorated with bas-relief depictions of 575 dragons and bulls in 13 alternating rows on glazed blue bricks.The brick was sculpted in low relief before being baked and was then coated with glazes in which pigments were blended with melted silica. During this period Babylon became the city of splendour as described by Herodotus. From the top of the gate an observer could see the whole city spread out below them. The Gate,built in 575 BCE,was excavated between 1899 and 1917 by a German archaeological team led by Robert Koldewey.After World War I,part of the gateway,the smaller one,was reconstructed in the Pergamon Museum in Berlin and it is widely regarded as one of the most spectacular reconstructions in the history of archaeology. The inner gate was so large that the Pergamon Museum didn’t have room to reconstruct it and its remains are currently in storage.A number of pieces from the Processional Way were sold to other museums around the world. * Every spring,a procession that included the King,members of his court and priests travelled to the “Akitu” Temple to celebrate the New Year’s Festival. ** New Year’s celebrations seem to have begun in Ancient Babylon.It was known as the feast of Akitu celebrated in April.Like many ancient New Year’s festivals,it glorified fertility on both an agricultural and cosmic scale.The idea that January 1st initiates a period of new beginning was instated by Pope Gregory XIII in 1582 and is based on the Julian calendar set by the emperor Julius Caesar in 46 BCE.